"The letter board was my freedom. This is it. It takes a while to learn how to use it, but it's worth it. Communication is the most important thing. I used to dream of talking, of course. But I am not free because I talk. I don't talk. I am free because I can express my ideas in pointing to letters, in typing, in my blog and in my speeches. I am not lonely now. Autism is a deep pit. Don't give up." "The Autism Book: What Every Parent Needs to Know About Early Detection, Treatment, Recovery and Prevention"
Author of "The Vaccine Book"
I'm looking forward to the Autism Speaks Pasadena Walk at the Rose Bowl on April 21st. It's a great event and way for me to meet with other Autism Heroes. I encourage you to attend any inspirational conferences or walks for Autism Syndrome Disorders (ASD) happening in your city. It's uplifting to be with people who are of like mind and spirit, build your knowledge and bond with folks who understand and care about the unimaginable life you lead. After events like this, I seem to be more proactive and confident. We need times to be fed by experts and parents who share their phenomenal stories rejuvenating our desires to be better Parents. Because the truth is we don't always feel like we are doing enough. Compliments from strangers actually perk me up. To my surprise, people are watching! Try to celebrate the successes of the day. Pat yourself on the back once in a while. You deserve it! Mistakes occur. Dwelling on them will hold us back. By God's grace, we can learn from everything. And most importantly share it, the good, bad, ugly, devastating and outrageously funny. That's why I love ASD events because I'm around people who get me. We inspire each other, just in, how we get through what we face daily. Hard times show us what we are made of and we get made over again and again and again.We are still standing and that is an AWESOME Truth Autism Hereos Live to Tell! You must know, most of the time I have no clue what to do in the situations my children present. I would love to see what my face looks like. I know the feeling so very well. It's not the deer caught in the head lights. It's not the jolt from being unexpectedly rear ended by the distracted driver. And it's not the heart palpitating fear we get when looking over the edge of a cliff. It's usually an out of body experience when everything goes in slow-motion. Yet, it happens in a matter of seconds. Then I snap to the job at hand and find a solution. We have to believe that we will somehow find ways, people, programs, organizations, events, activities and even medicines to push them into a place of self-reliance. Families like ours eventually address issues regarding medicine whether it be herbal supplements, prescriptions and or vitamins. As a parent of two boys on very different sides of the spectrum, I've considered many options. My oldest son, Carter, has always been verbal with a few challenges primarily anxiety and processing. He benefits from vitamins and supplements. My youngest is non-verbal and the journey to keep his behaviors regulated has been a roller-coaster ride. We seem to be in a good place right now with natural/herbal medicines. There is still occasional aggression, yet his focus and attention is wonderful. Each stage and growth spurt finds me re-evaluating. I took the boys to a highly recommended Herbalist & Certified Health Professional, Shirley Winslow, who works closely with Iridologist & Certified Health Professional, Gary Richer. They have helped many families like ours. Gary examines the eyes and blood, explains the findings and prescribes natural/herb supplements. Shirley assists with the supplements as she's been in the natural medicine business since 1973. We started off with pharmaceuticals recommend by physicians which worked for a while. Resperdal helped with sleep and attending and tantrums. 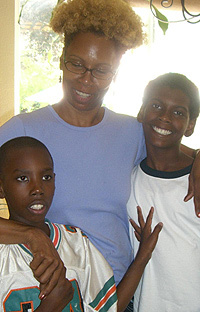 Yet, when my son, Bakary, became older whenever we missed a dose he had extreme outbursts, hurting himself and others. That bothered me. Because there are times when meds are forgotten ;-/ Now we are using natural medicines - herbs and vitamins only and when we miss a dosage things are not that dramatic. The herbal medicines and vitamins cost us about 50 dollars per month. Except when we run out of almost everything. Refilling at those times has been up to $120. Usually, then we get to skip a month, yey! Sing with me ... "Sooommmme - where, o-ver the rain-bow ... skys arrrrre bluuuuue. Annnd the dreams that you dare to dream, really do come true!" Fortunately, Gary has helped us. Showing me in his microscope the digestive issues and prescribing enzimes and supplements. It's a start. TACA, Talk About Curing Autism, has tips for biomedical treatments on their website. (See the link on the left.) They provide 10 points to guide you through "Biomedical Treatment on a Budget." 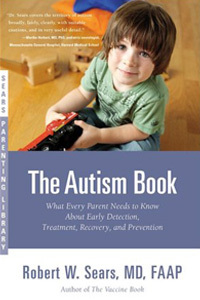 Dr. Bob Sears provides extensive information regarding testing and treatment in "The Autism Book." He explains it simply. This book really helped me understand precisely how these methods are most beneficial for people in the autism spectrum. Every situation is unique. Opinions vary and experts are still navigating relatively unknown territories. Whenever we find successful antidotes, we on the front lines must share this information. It is up to us to publish, announce and create awareness and specify exactly what circumstantial remedies worked for our children. We will assist many others in their decision making. We must be willing to put it all on the table so others may observe what worked, when, why and for what. Social media has been the angel of mercy for so many Mothers and Fathers seeking a solution or a kindred spirit. Sites like Babble.com. They list 25 Top Autism Spectrum Blogs!!! Check it out!!! You can even nominate your favorite to the list. What a wealth of comfort AND information!!! Just reading what Moms and Dads like me lived to tell gives me a sense of belonging. It's a kinship that is not easy to describe. Rob Groski on his blog "Lost & Tired" shares "10 Things My Autistic Kids Wish You Knew." A friend at work pointed me to this list a few weeks ago. Number 10, "I know I can be frustrating but don't tell me I won't amount to anything because I have Autism. If you love and support me I WILL do great things in my life in spite of my challenges." This man, while bringing me to tears, summed up my feelings ... what I know deep inside and don't always have the courage to voice. Thank you Rob. Honestly, parenting - special needs or not - is a figure it out as you go along type of job. That's why it's crucial that we help each other navigate the waters. And exercise patience while assisting a friend. We may not put it all together right away. We may not make the calls within the next few weeks. We may not even get it, though we nod our head in excitement and profuse thanks. But, at some point that moment of sharing takes root and off we soar, applying the wisdom of a dear comrade. The grace of the Autism Warrior is stealth love. We all progress one baby step at a time. And the journey is trail blazed along side of many others just like us who are working to build a new consciousness. Our Children WILL live in a world that understands who they are! THEY ARE ALREADY WORLD CHANGERS!!! The world changed the day they were born. Our autism culture will awaken everyone to BLESSINGS OUR CHILDREN have to offer. We must believe together, their divine giftings will be revealed to serve millions!! !